One small East African country embodies the battered history of the continent: patronised by colonialists, riven by civil war, confused by Cold War manoeuvring, proud, colorful, with Africa's best espresso and worst rail service. Michela Wrong brilliantly reveals the contradictions and comedy, past and present, of Eritrea. Just as the beat of a butterfly's wings is said to cause hurricanes on the other side of the world, so the affairs of tiny Eritrea reverberate onto the agenda of superpower strategists. This new book on Africa is from the author of the critically acclaimed In the Footsteps of Mr Kurtz. Eritrea is a little-known country scarred by decades of conflict and occupation. It has weathered the world's longest-running guerrilla war, and the dogged determination that secured victory against Ethiopia, its giant neighbour, is woven into the national psyche. Fascist Italy wanted Eritrea as the springboard for a new, racially-pure Roman empire, Britain sold off its industry for scrap, the US needed headquarters for its state-of-the-art spy station and the Soviet Union used it as a pawn in a proxy war. Michela Wrong reveals the breathtaking abuses this tiny nation has suffered and, with the sharp eye for detail that was the hallmark of her account of Mobutu's Congo, she tells the story of colonialism itself. Along the way, we meet a formidable Emperor, a guerrilla fighter who taught himself French cuisine in the bush, and a chemist who arranged the heist of his own laboratory. 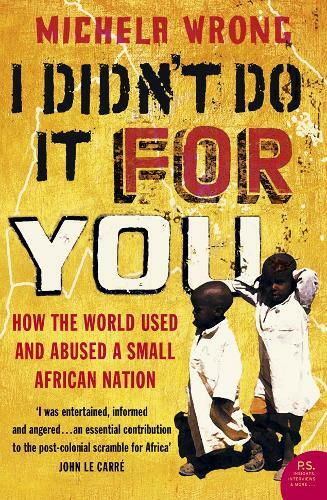 An arresting blend of travelogue and history, `I Didn't Do It For You' pierces the dark heart of our colonial history.